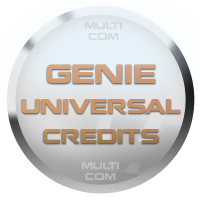 Genie Universal Credits are needed to perform certain functions when using the Genie Universal Box as unlock RAP3 SL3 (3600 slide, 5220XM, 7210 Supernova, 7310 Supernova, 7610 Supernova, 7510a) or repair COntact Service or generate RPL for Rapido. Question: I have good cable that works with JAF,UB,MTBOX, Asda beans can from 9 pence etc, but with the logger i got error 10 on sending code and i am charged 5 credits, can i get a refund ? Answer: Again no, its your responsibility to test the cable by other means first and preserve server bandwidth for other Genie users as well. Question: I have good RX2 cable, unlocked many phones with the logger but sometimes i have to do the read twice, the first time fails, but second time is ok, can i get the refund for the first credits lost ? Answer: This is caused by noisy interface as the RX2 communication is quite fast and error prone. Genie Team will not refund the lost credits as we don't have time keep track on every server operation. Using the service for RAP3 phones is entirely on users risk.